participated in Burleigh family concerts at home. When the New Orleans University Jubilee Singers came to Erie in 1888, he joined their tour, traveling and singing with them for eight months. In 1892, at just 16 years of age, Burleigh auditioned for and received a full four-year scholarship to the National Conservatory of Music in New York City. Erie’s citizens came together and donated money to help him afford living in this cultural capital. During the summer of 1892, Burleigh worked at the Grand Union Hotel in Saratoga Springs, where he also may have sung at Bethesda Episcopal Church. His time in Saratoga working in the service industry and singing in the church likely brought him in contact with local socialites, some of whom may have helped financehis education at the Conservatory. He also had the opportunity to hear world-famous African-American soprano Sissieretta Jones (Black Patti),who sang in Saratoga Springs that August. While Burleigh was at the Conservatory, Czech composer Antonín Dvorák mentored the young baritone. The two mutually inspired each other with the “Symphony in E Minor” (from the New World) reflecting the composer and Conservatory director’s appreciation for the significance and musicality of African-American music notable in his use of two spirituals. Because Burleigh was so integrated into the art music scene, his compositions (over 260 works) anr choral arrangements (almost 190) are valued and analyzed by scholars and performers. 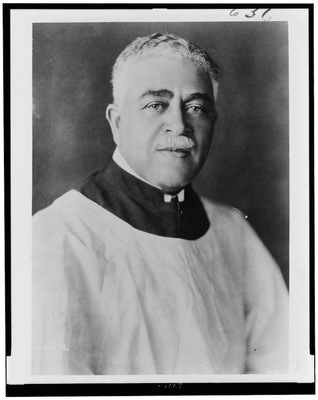 By combining his classical training and the African-American musical traditions he grew up with, Burleigh, in a sense, legitimized African-American spiritual music for a largely white audience. 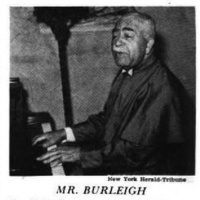 Throughout his life and career, which included singing for decades as a soloist at St George’s Episcopal Church of New York, Burleigh made a concerted effort to be true to his musical and cultural roots. Although there is only one known recording of him performing, his legacy continues on through his arrangements of spirituals from “Deep River” to “Swing Low Sweet Chariot,” and his many original compositions.